Victoria Miro Gallery is presenting the first of two exhibitions this autumn by the celebrated American artist Kara Walker. 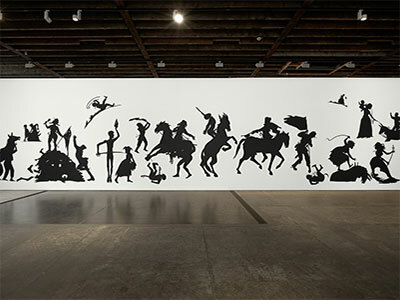 Often provocative and humorous, Kara Walker’s work explores the tensions and power plays of racial and gender relations. Walker’s work engages with historical narratives and the ways in which these stories have been suppressed, distorted and falsified. This exhibition extends her exploration of the brutalizing histories of colonialism and slavery, and the political and psychological consequences that accompanies identity formation in contexts of oppression and violence. Drawing from art historical and literary sources, Walker creates and deconstructs scenarios that expose biases and prejudices, exploring the power struggles underlying personal and political relationships. Her work proposes alternative mythologies, and new ways of engaging with traumatic historical material. Walker uses historical decorative styles including the silhouette to create complex and sophisticated narratives, emphasizing and undermining the ways in which images and narratives can be subject to stereotyping. For her first exhibition with Victoria Miro, Walker is producing a new body of work made with the gallery’s unique spaces in mind. In Go to Hell or Atlanta, Whichever Comes First Walker has drawn inspiration from the southern American city where she spent her teenage years. The centrepiece of the exhibition will be a cut paper installation and large scale photographic wallpaper. These works reference Stone Mountain, a park on the outskirts of Atlanta featuring the world’s largest exposed granite monolith, the surface of which features a partially completed bas-relief carving of Confederate generals on horseback. Stone Mountain has had a chequered history. In 1915 it was declared the spiritual home of the Ku Klux Klan; more recently it has become a theme park with a wild west train ride and popular laser shows. Walker’s work draws on the layered histories and associations of the site.